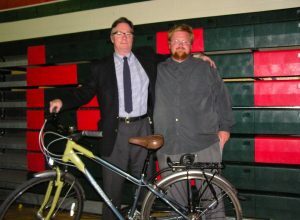 On May 6 in Stratford, Ontario, Stratford Central Secondary School welcomed poet and playwright James Reaney as the first inductee to the school’s Arts Hall of Fame. James Reaney went to high school there from 1939-1944. Reaney’s family, including his sister Wilma McCaig and his brother Ron Cooke, attended the induction ceremony at Central last week. In honour of the occasion, students staged the opening scene of James Reaney’s play, Colours in the Dark. James Stewart Reaney (James Reaney’s son) gave thanks on behalf of the Reaney family. “This kind of recognition, I know, would have touched Dad deeply,” he said. James Stewart Reaney and Rick Cooke with the bicycle from Colours in the Dark.